Once upon a time, bringing students in the door was an easy affair for colleges and universities. Beyond the elite of each high school class, the majority of prospective postsecondary students—devoid of much choice—simply looked to enroll full-time at their local higher education institution. As most leaders in this industry today know, times have changed in a very significant way. The higher education industry of yesteryear bears little resemblance to today’s marketplace. Institutions today must compete for enrollments against local, statewide and national colleges and universities. Students have an incredibly diverse choice available to them, with everything from modality to program type to concentration to price on the market. Standing out to today’s students—who are finally in the position of the scrutinizing customer when it comes to picking their institution—requires focus, investment and concerted effort to make the most of existing resources. Rather than relying on the “build it and they will come” approach to attracting students, today’s institutions need to focus on driving three critical points of attraction. In this instance, the institution is actively pursuing customers by sending a message that encourages interest and enrollment from prospective students. Tactically speaking, outbound attraction takes the form of traditional marketing and advertisements. This would be the magazine ads, TV spots, newspaper placements, billboards, radio segments, and website banners that get the institutional name out to a broad audience. This can also take the form of more pointed outreach. For example, flyers and emails to previous students, course catalog mailers, or partnerships with employers and associations offering tuition discounts. Additionally, you could be looking at “try before you buy” webinars and open offerings that draw students in and give them a taste of the kind of experience they could get at your institution before they pay to register. All these tactics are examples of how colleges and universities can proactively drive student interest in enrolling, and traditional CRM systems, such as Salesforce, are often the tool of choice for institutions driving outbound activity. Of course, leveraging these kinds of outbound tools effectively relies on the university or division running them being able to track the success of their activities. After all, anecdote and “feeling” might be leading you to invest more money into ineffective marketing channels. Without dashboards or robust data analytics in your arsenal, these potentially high-value outbound tools could be vastly underused. Colleges and universities have huge numbers of resources at their disposal when it comes to driving inbound attraction, but often those resources are not being leveraged to their fullest potential. This isn’t just a “build it and they will come”—it’s that concept, hypercharged. In this instance, universities are using modern digital marketing techniques. For example, creating a story on the institutional website that’s engaging to prospective students. After all—today’s learners are modern customers whose ideal scenario is to get all the information they need from a website before they even contact the institution. As such, beyond creating a story, the institution needs to be sharing as much information as possible around offerings (including compelling course descriptions), costs, availability, flexibility and more—everything a student will be seeking out. This information will be easy to find and the website, broadly, will be easy to navigate. Most importantly, that information needs to be accurate at all times. Diving further down the digital marketing rabbit-hole, the university website will be SEO-optimized so when a student searches “Accounting intro program” your university will be high up in the Google search results. Finally, the website itself will act as the conversion point that turns prospective students into registrations. The site should have a digital shopping cart and provide learners the opportunity to register and pay for courses on the spot. It should also provide them the opportunity to purchase any extras—like parking passes or childcare—that they might need to be a student at your school. By leveraging the resources already at most colleges’ disposal—and by making it easy for internal staff to keep the website up-to-date at the click of a button—effective inbound attraction becomes a reality that will appeal to modern students. Parallel attraction is a relatively unique aspect of the modern postsecondary environment. Basically, this point of attraction has current and former students marketing for the institution on the college’s behalf…. word-of-mouth marketing, for lack of a better term. We’re not just talking about friends and family here (although, as the student population ages, it would be great to get those kinds of recommendations). This could be in the form of an open-enrollment professional development student recommending their employer engage in a customized training partnership with a given institution. This could be someone going to their peers or other members of a professional association and suggesting they take a certain course. As the previous paragraph suggests, however, your institution must deliver a world-class student experience to compel students to market for you. So, what does it take to deliver the kind of experience that gets people talking? First, you need to ensure your staff have tools at their disposal that allow them to provide great service and engagement. That means they need to have access to full student records—from previous enrollments to financial information to prior interactions with other staff—that allows them to provide students the level of service they need without forcing the student to rehash their story over and over again. You also need to have self-service tools in place that allow students to manage as much of their own experience as possible without having to call for help. They need to be able to register, enroll, pay, log in, get necessary provisions and access critical paperwork without having to phone the office. This is the hallmark of a customer-friendly environment that allow students to put their focus and attention where it needs to be: on their studies. Finally, you need to make sure courses and programs are helping students achieve their goals. That means more than ensuring offerings are of the highest quality—that’s a given. The institution need to be flexible to market shifts, getting courses and programs to market that directly respond to the needs of their students and employers. Without flexibility and the capacity to launch new offerings quickly—or to adapt existing offerings to fit modern needs—students won’t be getting what they need out of their enrollment. When the fantastic experience is established, the students take over. They will share stories about their time at your institution, they will re-enroll when they need more learning, and they will encourage others to do the same. That’s where you’re wrong. 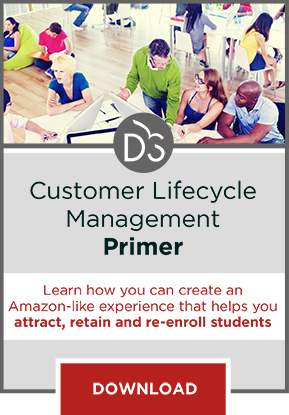 A Customer Lifecycle Management (CLM) system can create exactly this kind of customer-centric, class-leading environment at your institution. A CLM is designed to handle everything a traditional administrative system or SIS would manage, but while putting the learners’ experience at the forefront and designing all processes around it. Beyond transforming the student experience—driving parallel attraction—a CLM also makes marketing a breeze. rack the success of ongoing campaigns, helping to manage marketing spends and ensure investment is being maximized. Building an attraction machine that drives student interest, converts prospects to registrants and creates alumni who can’t stop talking about your school is closer than you think. All you need is the right system to help drive those efforts forward. To learn more how a Customer Lifecycle Management system can help your institution, download this primer.